I was staggered by how many entries I received for the competition and I loved the additional the comments and observations that people added to their entries. There were so many touching responses and reasons why people wanted to visit the Inn that I am sorry that I only have one prize. I hope that those of you who didn’t win will be tempted to try the Inn at Cedar Falls on your own (maybe you have already!) It is a lovely get away, cosy and relaxed and the food is very good. 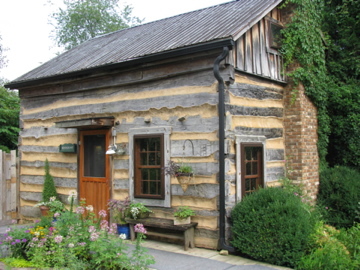 Combine it with a hike in the Hocking Hills or a spa treatment at the Inn (or both!) and you are in for a memorable trip. I had some entries for people who had been married at the Inn, some from people with special occasions coming up, or people who felt like they needed a break from the city or a romantic dinner for two. 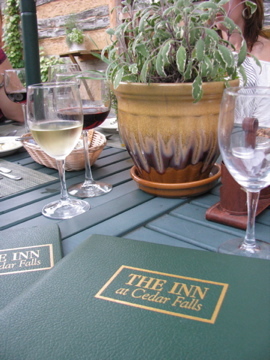 1)Which year did the Inn at Cedar Falls open? 2) Who was the founder (and also the first cook) at the Inn? 3) What is the name of the current chef? 4) How many people does the restaurant seat? 5) How many cottages does the Inn have? I enjoyed the entry that put all the answers into a story: ‘I remember the Inn when it was in the planning stages and founded in 1987 by Anne Castle. The Chef Anthony Schulz has purchased our locally grown produce for his restaurant that seats 45. We have stayed in one of the 12 cottages’. And also the person who added question number 6. Who wins this contest? (with their name). It was interesting to see the various email signatures and I discovered some new local companies, blogs and even a comic as a result. Jenna Wojdacz – Congratulations, I hope you have a wonderful time. Thank you to everyone who complimented my blog. I hope you will visit again and enjoy some of the other posts.